The Guyana Society for the Prevention of Cruelty to Animals (GSPCA) is adamant that the implementation and enforcement of legislation to foster responsible ownership of dangerous dogs can no longer be ignored. 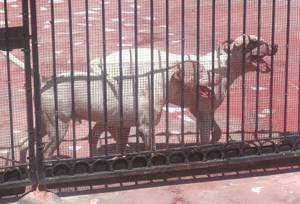 In a public missive, the Society was speaking directly to the recent killing of a woman by two family-owned pit-bulls. The organistion noted that responsible dog ownership is crucial in ensuring the safety of both humans and the animal. The GSPCA said that Trinidad and Tobago introduced their Dog Control (Amendment) Act 2014, and while this Act does not ban certain breeds of dogs as other similar legislation around the world does, it sets out certain regulations for owners such as the requirements to be licenced to own a dangerous dog (specifically a pit-bull in the case of Trinidad and Tobago’s Dog Control Act 2014); to have properly secured surroundings; to register the dog and also to have it micro-chipped. The Executive Committee believes that the issue of responsible animal ownership is a crucial one where any potentially dangerous dog breed is concerned. Additionally, in instances of the despicably cruel act of dog fighting occurring in Guyana, the Society believes that legislation governing the ownership of dangerous dogs is even more necessary. With the introduction of such legislation, they noted, it is however, the issue of effective enforcement of such legislation that must also be addressed. GSPCA also extended condolences to the family of Joann Carter who was mauled by two pit-bulls which her family raised. Her death is the latest of several sporadic attacks on humans by pit-bull dogs. Carter had been living in a separate flat on the property belonging to her sister and brother-in-law. She had been with the family for only three months when the dogs attacked and killed her. The issue of pit-bull ownership has always been one of public debate since there is no decisive legislation to speak to the ownership of dangerous dogs. The pit-bull breed in particular, is usually used in Guyana for security and profit purposes. They are bred for sale and sometimes for fighting.